An accomplished bandleader in his own right, Jay Wilbur (1898-1970) had enormous influence over the recording of British dance band music and over Elsie Carlisle’s “solo” output in his role as musical director for such labels as Dominion, Imperial, Eclipse, and Rex. 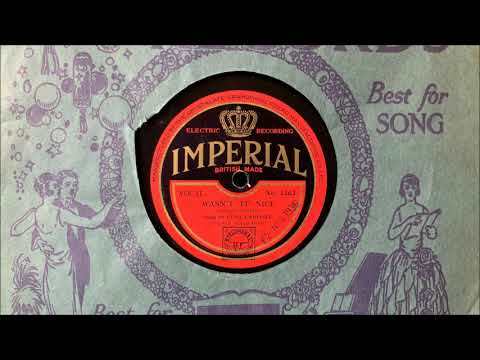 Just as it has long been the custom to identify the glorious voices (including Elsie’s) credited only as “vocal refrain” on dance band records, it is increasingly common to recognize the part that people such as Wilbur played in determining the sound of British popular music. It would be fair to say that Wilbur’s contributions to Elsie’s career rival those of Ambrose. “More Than You Know.” Lyrics by William Rose and Edward Eliscu, music by Vincent Youmans (1929). Composed for the film Great Day (unreleased). Recorded by Elsie Carlisle with Jay Wilbur and His Orchestra (uncredited) in London in late September 1930. Imperial 2362 mx. 5510-1. “More Than You Know” shares the structure of many Broadway tunes of its time, consisting of an introduction that is melodically quite different from the verses. Its intro is even more melancholy than the rest of the song, which is sad in tone but which encapsulates an effusive expression of love for a man without respect to any flaws he might have. Elsie Carlisle’s version fully embraces the gushing quality of the lyrics while maintaining a sense of credibility and sincerity. One might compare it to her recording of “What Is This Thing Called Love?” (which she had introduced on the London stage the previous year); in both, she evokes innocence and vulnerability of a sort that is immediately attractive to the listener. It is worth noting that the Imperial label of the disc on which “More Than You Know” is recorded mentions the film Great Day; there must have still been a keen expectation of the release of the film and a corresponding need for a tie-in. “More Than You Know” was recorded in 1929 in America by Helen Morgan, Ruth Etting, Libby Holman, and Carmel Myers. It was recorded in London in 1930-1931 by Zaidee Jackson, The Million-Airs (Arthur Lally dir., v. Maurice Elwin), Ambrose and His Orchestra (v. Sam Browne), The New Mayfair Dance Orchestra (Ray Noble dir. 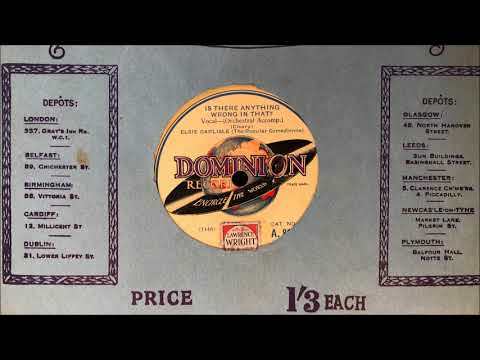 ; in a medley), Jack Payne and His BBC Dance Orchestra (v. Val Rosing; also in a medley), Gwladys Stanley, and Bert Maddison and His Dance Orchestra (Nat Star dir., v. Dan Donovan; in a medley). The lyrics of “Wasn’t It Nice?” describe an idyllic romantic relationship. They consist of fond recollections of the early days of that relationship and of the ensuing marriage (the refrain for each reminiscence is “Gee, dear, wasn’t it nice?”). There is a notable description of “canoedling” (cuddling in a boat, a common occupation in the years before motorcars were common enough to provide young couples with privacy). The lyrics also mention a wedding at which not only is the familiar rice thrown, but also shoes (an older practice) — one of which is said nonsensically to still have a foot in it! This last detail provides a suitable ending for a fundamentally goofy song. Elsie Carlisle’s version of “Wasn’t It Nice?” is noteworthy for its evocation of a certain sort of almost infantile femininity. Elsie perfectly captures a mood of youthful glee which is worlds away from the squeaky protestations of her also childlike persona in the rather sinister “Dada, Dada.” Particularly delightful is the primal girlish giggle that she emits at 2:09. The use of the chimes in the middle of the song adds to an overall feeling of simplicity and innocence, insofar as they recall the sounds of nursery toys. “Wasn’t It Nice?” was recorded in America in 1930 by Marion Harris, Tom Clines and His Music (v. Jack Carney), The Charleston Chasers, and Aileen Stanley. Other British bands who recorded it in 1930 were The Million-Airs (Arthur Lally dir., v. Maurice Elwin; in a medley), The Arcadians Dance Orchestra (John Firman dir. ), Van Phillips and His Band (v. Billy Milton), Bert Maddison and His Dance Orchestra (Nat Star dir., v. Fred Douglas; in a medley), Nat Star and His Dance Orchestra (v. Fred Douglas and Jack Hodges; in a medley), and the Million-Airs (Arthur Lally dir., v. Fred Douglas). “Shake Down the Stars.” Words by Eddie De Lange, music by Jimmy Van Heusen (1940). 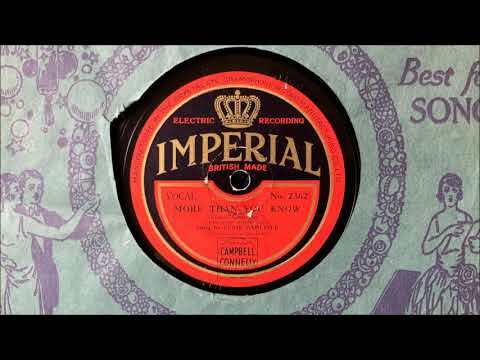 Recorded by Elsie Carlisle under the musical direction of Jay Wilbur in London on August 8, 1940. Rex 9847 mx. R4937-2. So I could scatter the stars…. The singer really says very little about her relationship, but she makes it clear how devastating its cessation is to her through the use of impressive hyperbole; in this way, the song resembles closely the 1932 song “Stop the Sun, Stop the Moon,” which Elsie Carlisle also recorded. In addition to the calls for the the astronomical order to be disrupted, the singer turns to the smaller things in life: “Crush every rose, / Hush every prayer…. / I know I can’t go on without you.” The impression is of a person to whom life has become worse than worthless: its continued existence is a mockery in light of her loss. 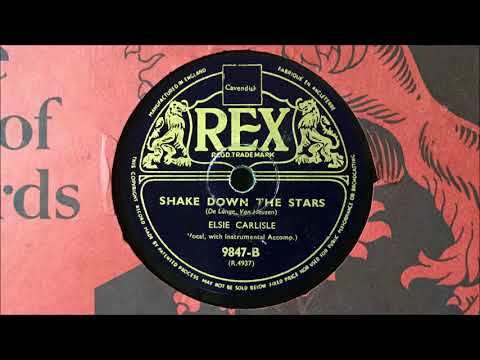 “Shake Down the Stars” was recorded by many artists in 1940. Elsie Carlisle’s version stands out as perhaps the least swingy of the lot, which is natural, insofar as it is intended to showcase the vocalist, not the band. The result is refreshing: Elsie’s more dramatic interpretation of the unusually tempestuous lyrics is more impressive to me than the other excellent versions. The novel rhythms of the latter are so distractingly upbeat that one almost forgets that the song is about destroying the universe out of frustration. “Shake Down the Stars” was recorded in 1940 in America by George Auld and His Orchestra (v. Kay Foster), Bob Crosby and His Orchestra (v. Bob Crosby), Glenn Miller and His Orchestra (v. Ray Eberle), Chick Bullock, Tommy Dorsey and His Orchestra (v. Frank Sinatra), Benny Goodman and His Orchestra (v. Helen Forrest), and Ella Fitzgerald and Her Famous Orchestra. 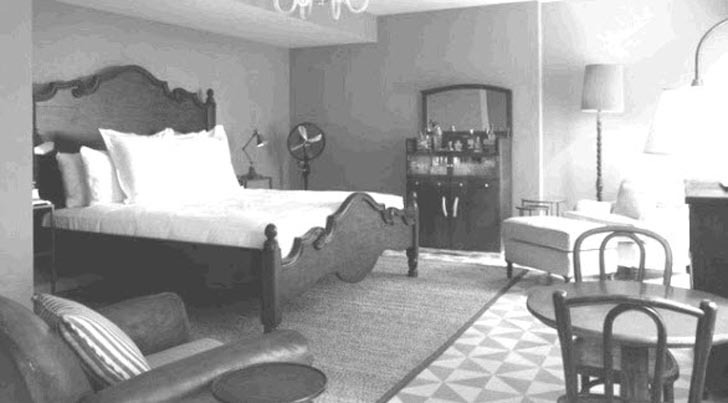 In 1940, British bands who recorded “Shake Down the Stars” include Harry Roy and His Band (v. Kay Harding), Carroll Gibbons and the Savoy Hotel Orpheans (v. Anne Lenner), Oscar Rabin (v. Beryl Davis), and Mantovani and His Orchestra.